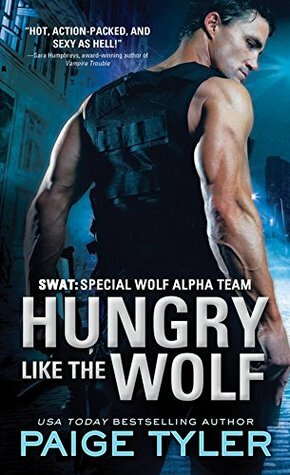 Paige Taylor's upcoming release, Hungry Like the Wolf, is a paranormal and suspense melded together for the perfect romance. I rated this book 4.5 wine glasses (review to come). It was my first read from Paige Tyler, but won't be my last!Find out more about this captivating new story below. One thing he never leaves home without: A piece of frag from an 82mm mortar. He keeps it in a small eyeglass case. Additional Notes: Really good at digging bullets out of werewolves. Congrats to Paige on the new release! I've only read her first book and I really, really enjoyed it :) I think I'd have to go back to the oldie but goodie, wolf shifter! Thanks for sharing! I kinda like the big cats in particular - I think it's the eyes! I'm going to have to go with either a wolf or cat, they are both beautiful creatures!! Congrats on the new release! Wolf and big cat shifters are my favorite but I'm really liking the bear shifters that are out there. Honestly, it is really hard for me to choose between a wolf and a big cat. It's between a Wolf and/or a Panther. I have Hungry Like A Wolf on my TRL. Thanks for the post and there giveaway. I like the big cats shifter. This book sounds really good. Thanks for having the giveaway. I love the Tiger and Jaguar shifters!